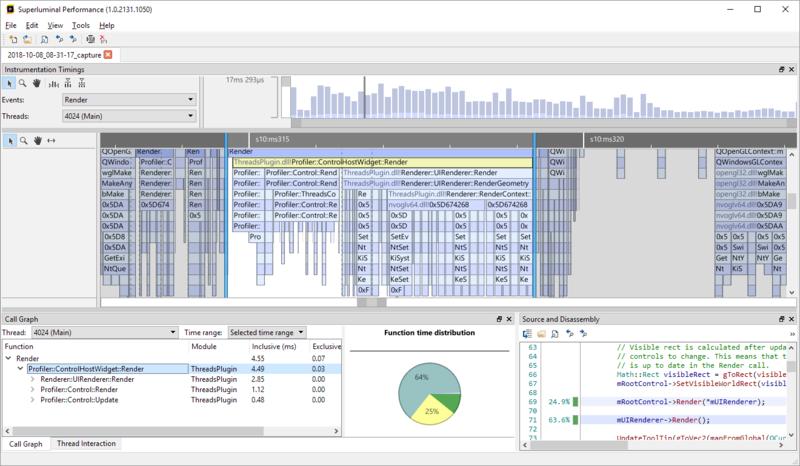 After two years of hard work, we are extremely excited to make our new C/C++ performance profiler available to the general public. Over the past 20 years, we have been fortunate enough to work with a lot of talented people on major video game titles like Halo and Horizon: Zero dawn. The problem of performance profiling and optimization has always been a significant portion of our projects’ time, and the platforms we’ve worked on had performance profilers with a varying degree of quality. The best profilers we have worked with were only available for PlayStation or Xbox developers and closed to the general public. One thing that struck us about the general approach in performance profiling is that most profilers tend to output a lot of numbers and text. It is up to the programmer to dive into these numbers and make some sense out of them. We also noticed that the largest portion of the time is not necessarily spend in finding the hotspot: in our experience, it’s mostly spent in analyzing the context surrounding it. We have always wondered: can we combine the best of the profilers we have worked with, and can we improve them in such a way that a profiler guides the user into the actual workflows in an intuitive way? What would a profiler look like if it was invented today? We’re really proud to finally release the culmination of our efforts – Superluminal Performance. Superluminal is a CPU profiler for Windows that has a unique seamless blend of sampling and instrumentation, in a smooth graphical user interface that allows you to browse through the entire history of your program’s execution. We invite you to browse through all features and documentation on our website. We think we’ve achieved something really special with Superluminal. Of course, you don’t have to take our word for it: a fully functional 7-day trial can be downloaded from our website. No registration required, no strings attached. This release is only the tip of the iceberg. We’re hard at work on new features and we intend to write more blog posts about both the development of our profiler, as well as performance optimization in general. If you have any questions, remarks, feedback, or anything else, we’d love to hear from you! You can get in touch by leaving a comment here, or contacting us through info@superluminal.eu. Your website doesn’t support pressing the “Home” button on the keyboard to scroll back to the start of the page. “End” works, PageUp/Down work, but not Home. This is very annoying while browsing your website, please fix! Thanks! Thanks for letting us know – we’ll have a look at it! Oh, this is on latest Chrome on Windows. Didn’t test other browsers.